and even so, you may worry that the treasure wilts for overwatering or lack of water. from terracotta and ceramic, it releases water properly, which saves your time and brings you a carefree travel. which means that it avoids plants' withering for overwatering or lack of water, and no soil or nutrients will lose. flip the bottle over and insert it into the soil, you can take a peaceful vacation. The spike will water your plants on its own. and work equally well in large planters and smaller pots. Any long-necked bottle can be placed onto the stake. and there is also packing on the top. 5. Flip over the whole body, and insert it into the soil. 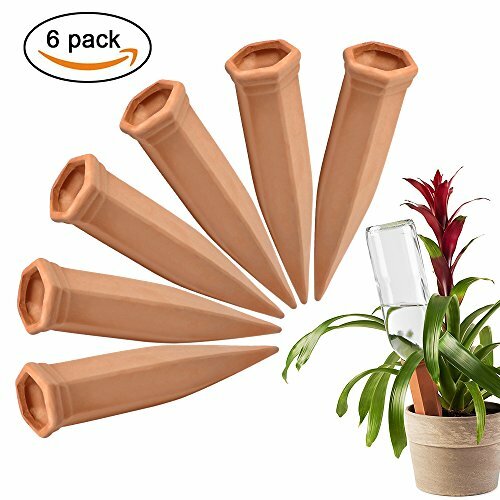 ✿Premium Material: Our plant watering spikes, made from terracotta and ceramics, release water and help moisten the soil. Durable, portable and light, it holds long-neck bottles from soda and beer size to large wine bottles with ease. ✿Economical Option: Compared with electrical self irrigation watering system, our watering spikes is much more economical and helpful. With this simple and cheap device, you can provide great care for your plants. You don't need worry that your beloved plants would wilt while on vacation. ✿Ergonomic Design: It's extremely easy to set up and use our plant watering bottle devices. No drilling needed, it disseminates water well and waters your lovely plants automatically. Hence, you don't have to water your plant every day and can save a lot of time. ✿Note: Please drop our self watering wine bottle in water to soak before using and dig the hole in the pot deep enough. Also, please test its watering time before leaving for vacation. If water in the bottle seeps out too slowly, please till the soil properly; please water the plants first with water pipe or faucet before setting up the spikes. ✿Guarantee: You can ask for full refund or a new replacement if a defective stake is sent to you. Still, if any problems with our self watering wine bottle, please feel free to contact us and we will provide best service for you.